Hi friends, today I'm back for Penguin Palace with a 10 minute card to share with you all. 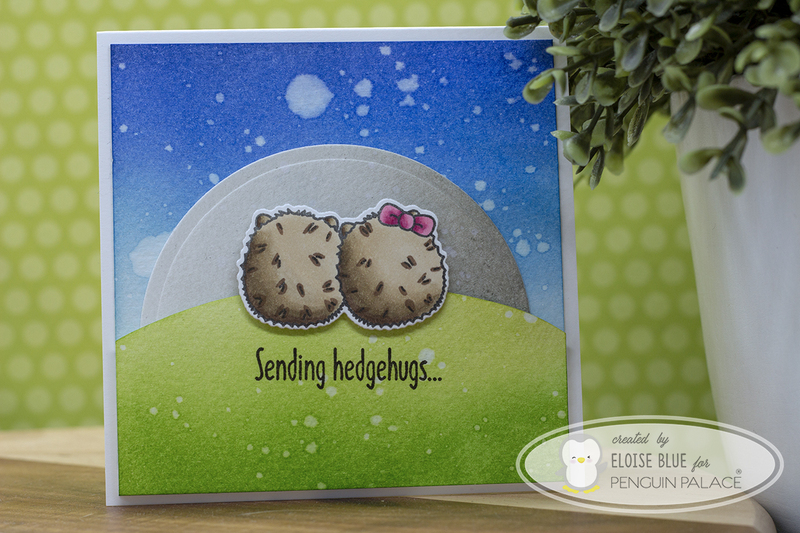 I'll be using the Hedgehogs in Love stamp set along with Distress Inks to create my card today. To start off my card today, I cut a square of watercolour paper, a circle and a hill piece and ink blended them in with Distress Inks. I used Tumbled Glass, Salty Ocean, Blueprint Sketch and Chipped Sapphire for the sky. Pumice Stone and Hickory Smoke for the moon and Shabby Shutters and Mowed Lawn for the hill. Once they were ink blended I flicked on some water and dried them off with a heat tool. I then adhered them together using flat adhesive and foam tape. 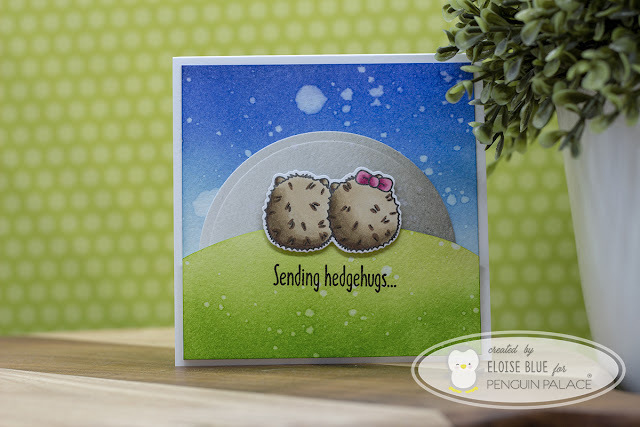 I then used the Hedgehogs in Love stamp set and stamped out the hugging pair. I then coloured them in with a couple of Copic Markers and die cut them out using the coordinating dies. I then added foam tape along the back and adhered it onto my scene. For the sentiment I used black ink and stamped the 'Sending Hedgehugs' on the bottom underneath the pair and that finished up my card for today. Thanks so much for stopping by today and I hope you enjoyed my super simple and easy 10 minute card for today.